While using WordPress as a CMS, I realised that an important CMS feature is missing. That is, Global Content Blocks. Global content blocks are repeated editable parts or region of your website. Having used other CMS like CMS Made Simple which has this feature, I really want to have this feature in WordPress. Imagine you are making a site for a client and have an Email address at the top of your site. Now, the client wants the above info to be editable. Sure, it is possible using a query_post that fetch a single post with the info or even editing the template itself. However, that may be very confusing for the client. With the Reusables plugin, the client will be able to edit the info region in just a few clicks, with WYSIWYG! It is also really easy to use and you can even embed the content blocks in a page, post or template. Setting up is just a few steps and after creating a “Reusable” region, just put the code <?php reus(“post-id”); ?> in your template or use the [reus id=123] to put it into a page or post. After that the client will be able to edit the region from the Reusables panel. The best thing is that you can add as many editable regions as you want! That makes the WordPress more flexible as a CMS. 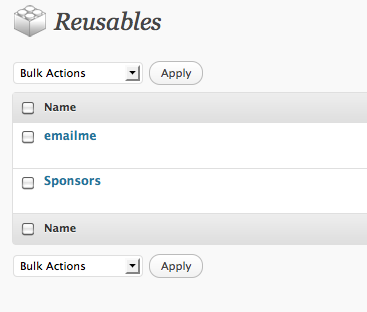 Now you can have other editable regions such as Sponsors, etc. The possibilities are unlimited. Is this plugin useful to you? Do you know other useful CMS plugins? Tell me in the comments below!